Have you got the Strictly bug? Would you like to learn the Waltz, Quickstep, Foxtrot, Tango, Rumba, Cha Cha Cha, etc, in a fun & friendly environment? Well, we have classes run by TLC for all levels from Absolute Beginners to Gold Level, in the most popular Ballroom & Latin dances. If you are coming on your own, the hardest thing will be walking through the door, but we give you a warm TLC welcome and you’ll feel right at home after that. Don’t panic about starting, as we assume you know nothing about dance, and with our wonderful teachers we can cure anyone with the ‘2 left feet’ syndrome! No partner is necessary as we rotate partners, which helps you meet new friends and makes a lovely warm and friendly vibe. Fear not – there are no exams and you will have sooooo much fun – guaranteed! Go on, take the chance, it might just change your life! We feel it is essential to master the basics in order to be able to dance socially, and we therefore offer a 4 week course for beginners (Level 1) which is great value for money. Advanced booking is required as we have limited space and these classes are extremely popular. Our schedule of dances throughout the year is listed below. Dancing is a very sociable activity, much more fun than going to a gym, and you will also learn a skill for life. While you are learning how to lead and follow with us, you will be able to get up on any dance floor whether at a wedding, a tea dance, on a cruise or at a social dance. Our philosophy is that dancing should be FUN and it doesn’t matter if you are not the best dancer or if you go wrong, as long as you are enjoying yourself. If you have danced before, please mention this to Tracie and the team when you register and we will put you in to one of our classes from Bronze, Silver or Gold depending on your experience. There is no need to bring partners as we all dance together in our respective classes so please encourage your friends to join you, or come on your own – you’ll meet some lovely people. Absolute Beginners – please see more info (below) – for all other levels there is no need to book, so just turn up, register and have a fantastic night of beautiful Ballroom. A faster paced Beginners class working on improving technique & skill. For those with a good knowledge of all dances. A faster paced class for those wanting more of a challenge. Classes can be on a pay-as-you-go basis. Vouchers for any of our courses or individual classes may be purchased as a wonderful gift. 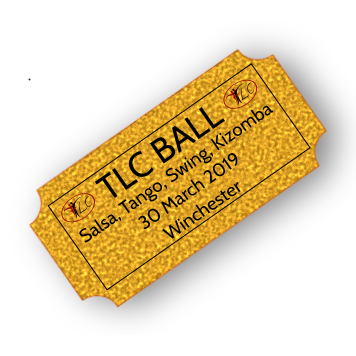 Monday ballroom is run by TLC at the TLC studio. Classes run every Monday EXCEPT Bank Holidays and Christmas. At the moment we have an additional Beginners course running at 6.30pm as the classes have been so popular this year, that they have been completely sold out. For the Foxtrot in February, there is one class at 6.30pm for Beginners and at 7.30pm there are 3 concurrent levels of classes at 7.30pm so that our structure of classes will bridge the gap for everyone to gain enough experience, without feeling rushed or bored. This way you will gain confidence to join the next level when you are ready. Normally, Absolute Beginners attend the first hour only, whilst the other classes each have 1 hour at an easier level, followed by 1 hour at a harder level. Most people attend for both hours to help them progress, but you are welcome to attend either hour separately. For the Waltz in March , we hope to have 2 concurrent classes at 6.30pm: one for the Beginners AND another class with another teacher for those who want a faster paced Beginners class who have already done one course of Waltz in January. Please book ahead to secure your place on these wonderful courses. Where we are learning 2 dance styles on one night, we have an hour for each style, each with 2 levels. Beginners (those with little or no experience in that style), and Improvers (those with a very good knowledge of the timing and basics in that style). We tend to dance the most popular styles for a month at a time and then switch to a different style. Sometimes we may add 2 styles in one week. Here’s the programme for the next few months.